It is acknowledged that The Borough Welsh Congregational Chapel is the mother chapel of the Welsh Congregationalists in London. Its history goes back to 1774 when a Welsh service was held in Cook Lane, Smithfield, through the efforts of Edward Jones, a member of the English Congregational Church in London, a lay preacher, and as a tradesman sold brandy and beer. The services were held in Cook Lane until 1785 when a Welsh Chapel was built in Wilderness Row. Shortly afterwards a Welsh service commenced in Gravel Lane, Borough, as a branch of Wilderness Row, but later a split came between the two congregations when Gravel Lane became completely Congregational and Wilderness Row completely Methodist. It appears that this was the beginning of Jewin Welsh Chapel. In 1806 a chapel was built in Little Guildford Street, Borough. The chapel held about five hundred and cost £1200 to build leasehold. On 8th August 1881, Mr David Simon Davies from Carmarthen College was ordained as the first Minister. About 1870 the freehold for the ground on which the chapel stood was purchased and a new chapel was built on the site. The foundation stone was laid on 31st July 1872 by Samuel Morley MP, a famous Congregationalist, who donated £500 to the new chapel which was opened on Sunday, 23rd February 1873. 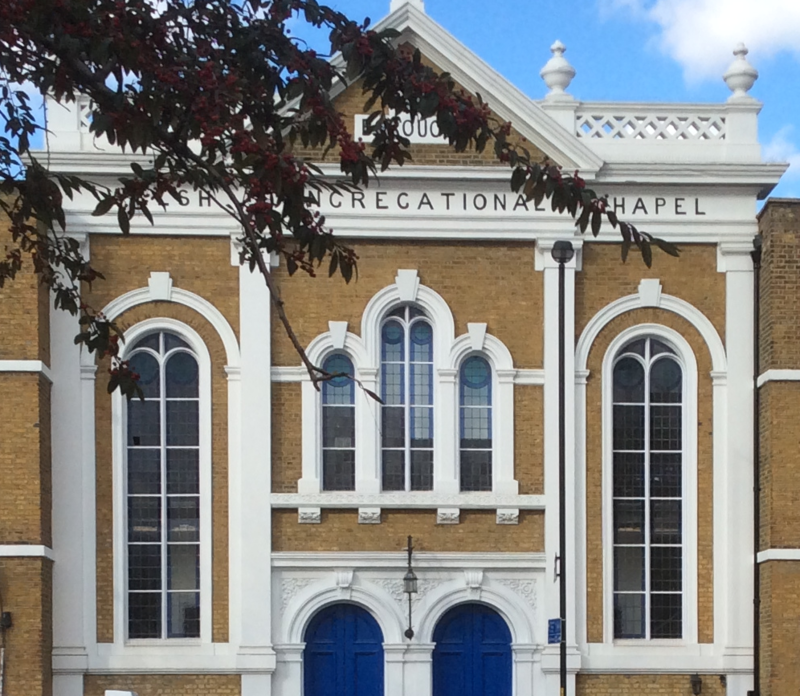 The Chapel today stands in the same place as the old chapel but instead of the entrance facing Little Guildford Street, it now faces Southwark Bridge Road. In the storm on 25th January 1990, part of the roof and two chimneys fell into the Chapel causing a great deal of damage. It took six months to rebuild the gallery, and during this time services were held in the vestry. The Chapel was re-opened on 22nd November 1990. The first chapel on the present site was opened on 5 January 1807. Mr David Simon Davies from Carmarthen College was ordained as the first Minister on 8 August 1811. He was very popular with the members and remained in the Borough until his death on 18 July 1826. He was buried in Bunhill Fields Cemetery. On 19 July 1831 Mr David Davies (again from Carmarthen College) was ordained and remained for many years as a well-loved and popular Minister. In 1866 the Lease on the Chapel expired and the congregation had to move out. After a great deal of fund raising and donations it became possible to buy the Freehold of the site and a new Chapel was built, which is the present Borough Chapel. The foundation stone was laid on 31 July 1872 by Mr Samuel Morley, MP. In October 1875 the Rev Lewys Thomas was ordained as the first Minister of the new chapel. He had previously been Minister of Bethania, LIanon, and LIwynteg, Carmarthen. He was popular with both the English and Welsh. He remained as Minister for ten years but then became ill. He went to Madeira to try to regain his health but sadly died there on 4 January 1888. On the first Sunday in August 1890, Rev D C Jones from Bethesda, Merthyr, commenced his ministry and remained in the Borough for over 46 years until his death on 1 September 1936. During his ministry the Chapel thrived. The famous Borough Welsh Choir was formed under the baton of D C James. They won in the National Eisteddfod and were successful in many eisteddfodau in London. They also made gramophone recordings. The Rev D C Jones was very involved with the Choir and he often advised D C James on choice of music. He continued as Minister and died aged 84 on 1 September 1936. He was buried in Dinas, Pembrokeshire in the grave of his wife and only son Campbell. As long as the Borough Chapel remains the memory of Rev D C Jones will be important and valuable in the history of the Chapel. During the year 1939 Gwilym Bowyer accepted the invitation to become Minister of the Chapel. When he commenced his Ministry on 22 October 1939, the Second World War had started and because of all the uncertainty during this period his ordination was delayed until March 1940. His wife and son returned to Wales, but he remained in London and lived with Mr & Mrs Evan George, who were members of the Chapel. In August 1943 he was invited by Ebeneser Chapel in Bangor to become their Minister, which he accepted, and remained there until 1946. In October 1946 he commenced as the Head of Bala-Bangor College, and remained in the post until his death on 5 October 1965. The Rev Dr Ifor M Edwards came to the Borough Chapel in 1946. He had previously served Dyfnant Chapel, Swansea. He had left Aberhonddu College in 1944 with a BA and BD. During his time in London he gained two further degrees MTh and PhD from the University of London. He was a keen supporter of the Borough Drama Group and appeared in several of their productions. He was also a keen soccer player and played for Tooting and Mitcham. On Borough Chapel summer outings you would see him playing cricket. He had a good singing voice and sang with the Borough Choir. It was a very sad day when he retired in September 1978 having served the Chapel for 32 years. After Rev Dr Ifor M Edwards retired the Chapel continued for many years without a permanent Minister. During this time we were fortunate in having the services of many ministers – Erasmus Jones, Roderick LIoyd, D M Thomas, Arfon Jones, and occasionally the Chapel members put together a service themselves. At this time Rev Gwylfa Evans was Minister of Harrow Chapel. He was ordained there in September 1978. In 1983 he became Minister of Radnor Walk Chapel and then the Borough Chapel and Kings Cross Chapel in 1998.